The success of the Institute for Conservation Leadership relies on the support of people like you. The Institute builds and strengthens leaders at every level – local, regional, state and national. These leaders work smartly and tirelessly on behalf of us. They promote and protect our communities, our water, our air, our land, our imperiled planet’s health, and our children’s future. You know leaders and groups who are increasing their efforts and tackling the Earth’s toughest issues. Groups need the Institute for Conservation Leadership’s support and expert guidance. 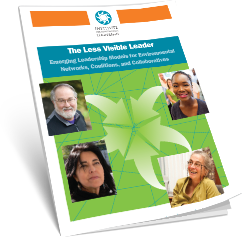 The importance of leadership for the Earth – and the urgency of need to support leaders at every level – has never been greater. Your gift will help leaders, groups, and coalitions improve their winning strategies, raise needed money, find new volunteers, and create new partnerships. Making a bequest through a will enables you to designate a contribution while retaining full control of your assets throughout your life. You can bequeath a specific amount of money, a percentage of your estate, or specific property. Your charitable gift may also reduce taxes due on your estate. The wording of a bequest provision will vary depending on the type of gift—see examples below. We encourage you to talk with your legal and tax advisors about the type of bequest that might work best for you. If you’re considering a gift restricted to a particular aspect of our work, please consult with us as well, so that we can make sure your wishes are honored. There are two primary types of charitable trusts, or living trusts, through which you can contribute to the Institute for Conservation Leadership. One is a charitable remainder trust. This provides you or other beneficiaries you name with a stream of income for life or a period of years. Almost any asset can be used to fund the trust, and it can be tailored to suit almost any financial or estate-planning goal. When the trust terminates, the remainder goes to the Institute for Conservation Leadership. By contrast, a charitable lead trust allows you to make a future transfer of assets to your heirs at a significantly reduced gift and estate tax cost, while supporting the Institute for Conservation Leadership with fixed income during the term of the trust. When the trust terminates, the assets are passed to the beneficiaries you have named. We encourage you to talk with your legal and tax advisors about the type of trust that might work best for you. Appreciated securities are perhaps the most cost-effective assets to use in making a gift. When you transfer ownership of stock, you receive a charitable tax deduction for the full market value and incur no capital gains tax (subject to IRS deduction limits) on shares held for at least one year. These tax advantages can decrease the cost of your gift while increasing the amount you can afford to give. It can also be a wise financial move to contribute stock that has decreased in value. You can declare a loss, receive a tax deduction for the fair-market value of the shares, and use cash that you might otherwise have donated to purchase the same or other securities when rates are low. Because electronic transfers are made without identifying the donor, please alert us in advance about the stock and number of shares you plan to give. You can do so by contacting Dianne Russell, Executive Director, at Dianne@icl.org. You can donate all or a portion of your IRA, 401(k), 403(b), Keogh, or other qualified retirement plan to the Institute for Conservation Leadership, or even make the Institute for Conservation Leadership a beneficiary of your retirement plan. This type of gift can help you reduce the taxes you pay on retirement savings—giving you more control over your money and the chance to have the greatest possible impact. We encourage you to talk with your legal and tax advisors about whether this is a good option for you. A simple way to provide a future gift is to name the Institute for Conservation Leadership as a first, second, or contingent beneficiary of a life insurance policy. Your estate will receive a tax deduction for insurance proceeds that pass to the Institute for Conservation Leadership on your death. You also may name the Institute for Conservation Leadership as both owner and beneficiary of a life insurance policy. This irrevocable gift would entitle you to a tax deduction in the year you make your gift. If your policy is not yet fully paid, you may make tax-deductible contributions to the Institute for Conservation Leadership to cover future premium payments. Such a gift can be a cost-effective way to make a significant contribution to our work. If you have already established a legacy gift to Institute for Conservation Leadership, please let us know so we may express our gratitude and ensure your wishes are met. On behalf of the many hundreds of leaders who turn to us – not to mention the next generation of leaders for the Earth, including your daughters, sons, nieces, nephews and grandchildren – we thank you!